On November 6th 2003, as the Sumo world was completing the final preparations for the coming Kyushu tournament, it was shaken by a fresh development. In the morning of that dark day Akebono handed his retirement notice to his master Azumazeki-oyakata, and quit the Nihon Sumo Kyokai (NSK). 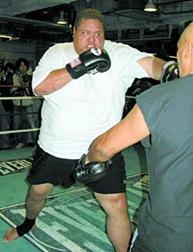 In the afternoon of the same day, accompanied by Tanigawa, a famous producer of the lucrative K-1 league (a mixture of various martial arts which can be compared to boxing both with hands and feet), he announced at an impromptu press conference in a Tokyo hotel that he was quitting the world of Sumo to become a K-1 kick-boxer. The contract that binds Akebono (2m03 and 233 kg) and K-1 is for the duration of at least 3 fights, the first of which would take place on December 31st 2003 in Tokyo, against the former American football player Bob Sapp (2m02 and 170 kg). From the moment this news was announced, statements and often condemnations rained from all sides, denouncing Akebono�s move, saying it would deride the honour of the rank of Yokozuna and so tarnish the whole Sumo world. Japanese nationalists attacked Akebono and claimed that foreigners do not have the necessary dignity that comes with the highest rank of Yokozuna. They hoped to exploit this painful even to incite the NSK to reverse its attitude towards foreign rikishi, and the future will show us if they succeeded. And yet, the harshest attacks came from the people closest to Akebono. In fact, the former Sekiwake Takamiyama, his own Oyakata and the first Hawaiian rikishi had the strongest words to say against the one he loved and held as his own son, saying he felt betrayed. But what could have pushed Akebono into this folly, considering his ailing knees? Was it the simple attraction of easy money or the desire to face a challenge? Coolly looking at the facts, it turns out that things were not that simple. Let us go back to the end of 1998, just before the November Kyushu tournament. 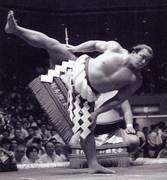 Akebono, the first foreign Yokozuna and at the time winner of 9 yusho, gravely injured his back and his knees were giving him a lot of pain as well. Akebono was going through a very difficult period, was absent for three consecutive tournaments, and even handed his resignation to the NSK chairman. But the chairman explained to him that, with the two Yokozuna Takanohana and Wakanohana injured, the situation was critical and demanded one more try from him. Akebono understood his responsibilities as a Yokozuna and took part in the May tournament of 1999, where he lost his first two bouts. 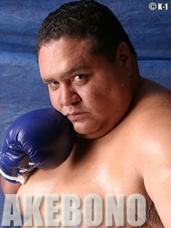 Because the world of Sumo needed him, Akebono did not fall to pieces � he recovered to finish 11-4. In the following year, he would win his 10th and 11th yusho to retire with dignity at the top, totalling the greatest number of wins (76) in the year 2000. This painful and valiant end of Akebono�s career proved at least one thing: if there is a club of Yokozuna who knows the meaning of the word �responsibility�, Akebono is a member. Aware of this context, we can now get down to the problem Akebono had to face. In order to pass on his experience to the younger generation by becoming a Sumo master (Oyakata), he had to acquire an elder�s name (toshiyori-kabu) of which there are exactly 105. There is one sole exception to this rule. Indeed, the NSK can award a one-generation elder�s name (ichidai-toshiyori) to an exceptional Yokozuna, which is valid only for him and cannot be transferred to anyone else. In Sumo history, only Yokozuna Taiho (32 yusho), Kitanoumi (24 yusho), Chiyonofuji (31 yusho) and Takanohana (22 yusho) were awarded this honour, and they all had won over 20 yusho. Unfortunately for him, Akebono with his 11 yusho did not belong to this exclusive club of Yokozuna and if he wanted to run a stable he had to acquire an elder�s name, which requires a real fortune, between 100 to 200 million yen. One might wonder how the other rikishi could collect such a sum at the end of their careers, when the overwhelming majority didn�t have one tenth of Akebono�s career success. Here we come to the heart of the problem. 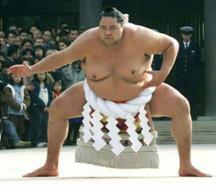 In Japan, Sumo is not considered to be an ordinary sport. Indeed, for every little Japanese town and even prefecture, having a young man start his career in Sumo is a true cause for pride, and it is not uncommon that local notables (mayors, industrials, etc.) inform the Oyakata of potential recruits from their towns. In this way, when a rikishi manages to come through and become a Sekitori, he has a whole region behind him, supporting him both morally and financially, and gathered in a support group. For sponsors, having a business dinner with a Sekitori is a huge sign of prestige for the host and consequently is good for business. Indeed it is this network of patrons who are Sumo enthusiasts that financially supports the rikishi in his quest to acquire a miyoseki (license to work as an Oyakata, same as a toshiyori-kabu). Of course, Akebono also had a group of supporters, but it was nothing like what a rikishi coming from some corner of Japan could have. There was no trust between Akebono and his support group. They even reproached him with taking some decisions without even consulting them (for example his wedding an American). The relations had worsened to the degree that the support group disbanded, leaving Akebono to his own devices at the end of his career, at the time he would need them the most. The NSK wasn�t unaware of Akebono�s situation, but they were content to follow a rule devised especially for retiring Yokozuna, which allows them 2 to 5 years of delay to acquire an elder�s name. Even though this rule widened his manoeuvring space, Akebono still had his problems with staying on in the world of Sumo. In fact, he already agreed to the idea of inheriting the elder�s name Azumazeki from his master, and with it his stable, Azumazeki-beya, with Sekitori Takamisakari and Ushiomaru. But unfortunately for Akebono, Azumazeki oyakata would not retire until June of 2009, while Akebono�s tenure with the NSK lasted only until January of 2006. After that time Akebono would have to leave the NSK and could never afterwards assume the title of Oyakata, which is needed for leading a heya. In such a case, he could only become a trainer under another Oyakata, which is inconceivable for one of the best Yokozuna in history. So, to remain with the NSK, Akebono had no other choice but to try to find those 100 to 200 millions yen with which to buy the right to remain with the NSK on his own, between January 2006 and June 2009. Even if that were accomplished, the story would be far from having a happy ending. Even supposing Akebono managed to gather the money by means of a bank loan or sponsorship, the troubles would only have begun for him. In fact, if no Oyakata would retire or leave the NSK before January 2006, Akebono would still find himself without a miyoseki at the end of his transitory period and would end up immediately excluded from the NSK. This would then signify a second and final retreat from the world of Sumo, after the moving ceremony of retirement (danpatsu-shiki) at the Kokugikan in Tokyo on September 29th 2001. So, his future in the NSK was totally uncertain and certainly difficult for a head of a family with 3 children to support his family. And even if he would manage to obtain his elder�s name, he would be faced with a prospect of returning the eventual loan and leading a life in the NSK where individuality comes after the collective result, in the image of Japanese society. Moreover, considering his Hawaiian origins, Akebono probably felt he would face all imaginable problems in climbing to higher positions and responsibilities within the NSK. Finally, Akebono was used to a high-profile lifestyle with a lot of public exposure. So the prospect of living a withdrawn life in the NSK, without complete freedom of using his image as he pleases (like Konishiki, a master of publicity and a television star in Japan) must also have made him think twice. If one considers now the proposition put to Akebono to leave for K-1, one realizes that instead of borrowing millions of Euros, he put himself in the position to immediately earn them, and more. What is more, he finds himself immediately facing a challenge he loves to accept, because you could say that Akebono remained a fighter in his heart. Also, provided he survives those three fights, he would become an icon in Japan for facing one of the maddest challenges and would be assured of leading a much more exciting life with many lucrative offers. To conclude, Akebono gains on all sides by signing up with K-1, which offers him a better quality of life, and a secure and exciting future. 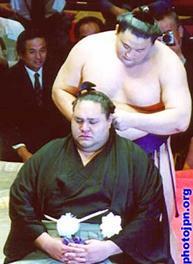 As for the dignity of Yokozuna, Akebono gave a lot and came forward when they needed him the most. In spite of these arguments, one question remains unclear. Why did the NSK allow Akebono, one of the best rikishi of all times, to get into such a hopeless situation if they had really wanted to keep him in the world of Sumo? Indeed, it must have been this thought that pushed Akebono to leave. He had already made three previous attempts to resign, but the NSK never reacted and let its Champion put on the boxing-gloves. During the press conference, Akebono stated that many Oyakata phoned him to wish him good luck in his new endeavour, but after a loud silence added that not one of them told him he regretted his leaving and that he should remain with them. Due to its way of functioning, the NSK is made up of former rikishi, who are far from being experts in human relations. In the space of several years they lost very popular rikishi such as Yokozuna Wakanohana and Akebono, and Ozeki Konishiki. All those Sumo stars of the 1990s would have doubtlessly been a considerable help to the NSK to evolve in modern Japan. It is to be hoped that the chairmanship of Kitanoumi will be the one to bring change in many areas, and that when the time comes they will know to keep the brilliant and rebellious Yokozuna Asashoryu, in many ways very similar to Akebono, in the Sumo world.